Sunday 31st March 2013. There was a fire in the Pandan area in Selangor this morning (possibly on the border of Pandan Indah - Kawasan Perindustrian Ringan Kampung Baru Ampang area) at the Light Industrial Area of Ampang New Village. 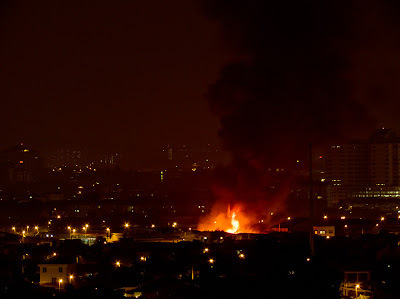 The area affected are some factories located between Jalan 14 (Ampang New Village Light Industrial Area) and Jalan 11 of the Kg Baru Ampang Tambahan/Pandan Indah Light Industrial Area , just off Jalan Pandan Indah. The fire probably started just before 2am. By the time we noticed it from our balcony around 2.10am, the smoke plume had just risen to about eye level when viewed from our place. The fire was huge and on three occasions we saw huge fireballs erupting into the air. Photo at 2.10am - the smoke plume was black and had just risen to eye level when viewed from our 13th floor balcony in Bandar Baru Ampang. 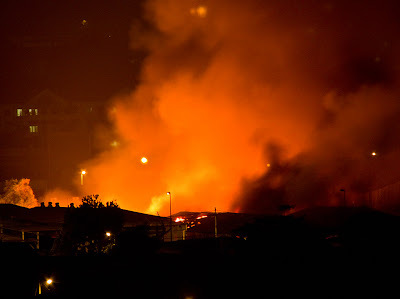 Photo at 2.14am - the fire getting stronger. After this there were several flare-ups that rose to as high as the height of the electric pylon. At one stage, the fire seemed to be under control, and smoke that is more white in colour were seen rising from it. However, the situation took a turn and flames and black smoke were seen spewing from an area that wasn't on fire in the early stages of the event. Photo at 2.29am The fire engulfing another building to the side of the fire. Photo at 2.37am - You can see fire on the roof of the structure. This was after a huge fireball erupted from the fire. 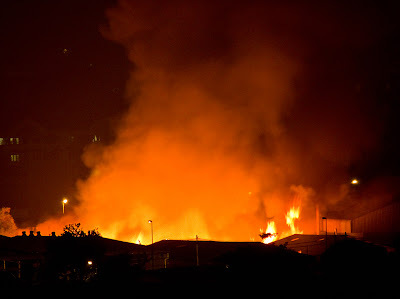 Even now at 4.08am, there is an orange glow and white smoke rising from the area. Here's the video of one of the fire flare-up. The flare-up is around the 1.00 minute mark. UPDATE: The area affected was at the light industrial area of Ampang New Village, just off from Jalan Pandan Indah, Selangor. 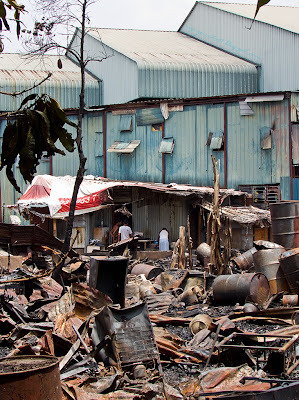 I managed to talk to the wife of a factory owner who was there around midday. 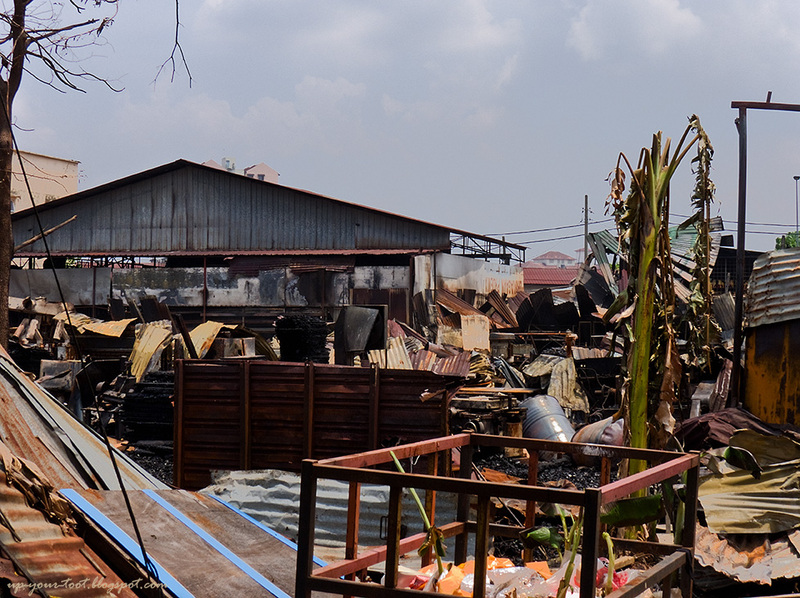 According to her, the fire appeared to have started from some factory on Jalan 11 (the Pandan Indah/Kg Baru Ampang Tambahan side), but spread and gutted theirs on Jalan 14 (the Ampang New Village Industrial Area side). She said thankfully her worker managed to escape unhurt and that she received a call about the fire past 2am. Some of the workers cleaning up during midday. At that time, the firemen were also clearing up their equipment. The area razed was far less extensive than what would have been expected from the flames in the early morning hours of Sunday. 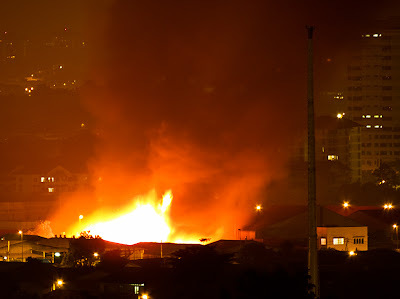 Perhaps the gas canisters and large metal drums that were 'blown' open from the heat might be source of the intense flames and spectacular flare-ups. 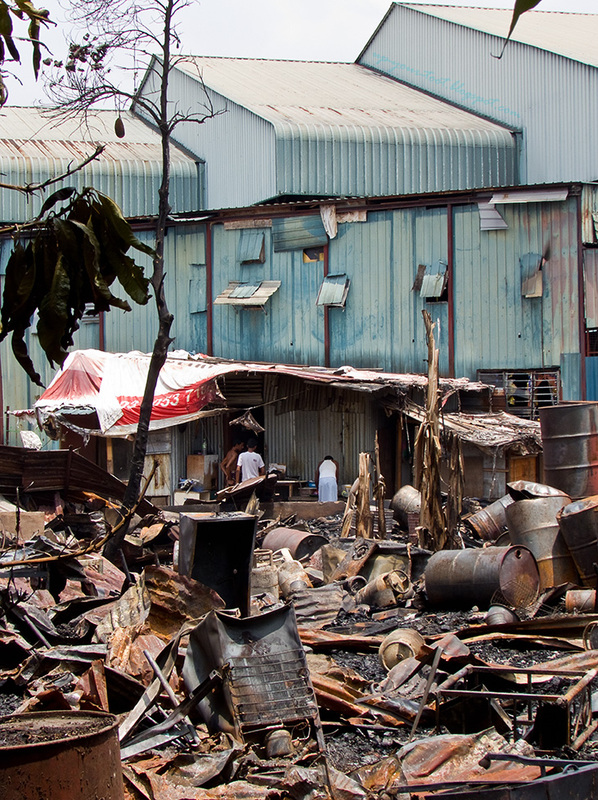 After the fire, only a pile of scrap metal remains. The large metal drums must have taken a beating from the heat - the top cover have signs of 'blowing open' at the sealed edge. Gosh the fire is huge. Hope no one is hurt. I hope so too. It could be from the Ampang New Village Industrial Area on this side of Jalan Pandan Indah, which would probably be deserted at night. Yeah. Luckily it didn't 'jump' a road and spread to the kampung houses nearby or go down the row and hit a cooking gas filling and distribution centre. If not, we would have flying canisters all over the place. The fire looks huge! The damage must be a lot but hopefully no one was injured. Yeah, the two factories that I saw the next day were reduced to scrap metal. Luckily no one was injured. Some of them have foreign workers living in them!